Stell Enterprises is family owned and operated and has been serving Northeast Pennsylvania for over 50 years. 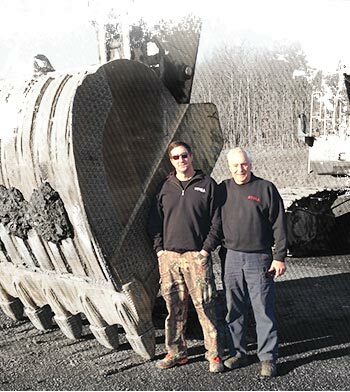 Pictured L – R, Robert M. Stella and Robert Stella, Sr.
Stell Enterprises, Inc., established in 1982 by Robert Stella, Sr., is a family owned construction business located in Plains Township, Luzerne County, Pennsylvania. Located in the heart of the northeast Pennsylvania coal belt, Stell originated its business around the coal industry. Over the past decades the company has grown and evolved to not only handle mining projects, but specialize in paving, environmental management, erosion control, heavy construction, utility work and road construction. In addition to these services, Stell has developed a substantial demolition reputation within its service reach. Work efforts have been focused within a one hundred mile radius of its central office with a wide range of clients. Stell services individuals, municipal governments, small business, large industries and national franchise developers in their efforts. Particular attention is paid to client relations and service. Stell’s goal is to maintain a high level of client satisfaction, service and quality on any project they are involved on. Particular attention is paid to the client’s needs on each project with every effort made to meet schedules and budgets. Stell, being diversified in the industry, is very familiar with current regulations and safety compliance requirements. Additionally, Stell works closely with regulatory agencies to achieve project compliance and meet project needs, specifically with PaDEP, MSHA, PADOT and local agencies. Stell also retains a licensed professional engineer for regular consultation, in-house design, and prject oversight as needed. Copyright © 2019 Stell Enterprises, Inc. All Rights Reserved. Website Development by Mike Hollos.